We started working in Australia in the late 1970s the new fields of English as a Second Language and multicultural education. We felt uncomfortable with the first wave of multicultural initiatives, which we believed to be tokenistic. We encountered a curriculum which remained substantially unchanged, despite the sprinkling of national day festivals and curriculum units which presented a tourist-postcard view of ‘other countries and cultures’. We thought this ‘spaghetti and polka’ approach to diversity amongst learners created as many new problems as it solved old ones. The key, we felt, was a more foundational approach in which every learner was encouraged to consider the role of culture and diversity in their own lives. The result was a large curriculum research and development project funded by the Commonwealth Schools Commission and sponsored by the Catholic Education Office in Sydney, the ‘Social Literacy Project’. The main focus of Social Literacy was concept formation and integrated approaches to learner diversity, language learning and multidisciplinary problem solving. Kalantzis, Mary and Bill Cope, ‘Multicultural Education: Transforming the Mainstream’, in Stephen May (ed. ), Critical Multiculturalism: Rethinking Multicultural and Anti-Racist Education, Falmer Press, London, 1999, pp.245-276. From the mid 1980s, we began to work in the field of literacy, taking up positions at the Centre for Multicultural Studies at the University of Wollongong. We became concerned that the newer approaches, such as whole language and process writing, seemed to work well for affluent, first language speakers of the dominant national language but did not necessarily work so well for children from poorer families and those who did not speak that language at home. Out of this arose the ‘genre’ approach to literacy, which aimed to engage learners explicitly with the languages of success at school and social power, using a functional linguistic approach in which linked textual conventions to their social purposes. A year in 1990-1991 for Mary on a Fulbright award at Keene State College in the University of New Hampshire and for Bill a Visiting Fellow position at Harvard, broadened our understanding of the politics of diversity in education and international debates about literacy. In the mid nineties, this work evolved into the ‘Multiliteracies’ theory of contemporary literacy. By then, we had moved to James Cook University of North Queensland. Along with several of the ‘genre’ theorists, in 1994 we brought together a group of the world’s leading literacy educators for a week in the small town of New London, New Hampshire. Here, this group (which later became know as the ‘New London Group’) coined the term ‘Multiliteracies’ and began a collaboration which culminated in publication of an article of the same name in the 1996 Harvard Educational Review and 2000 book. The New London Group at its first meeting, New London, New Hampshire, September 1994. 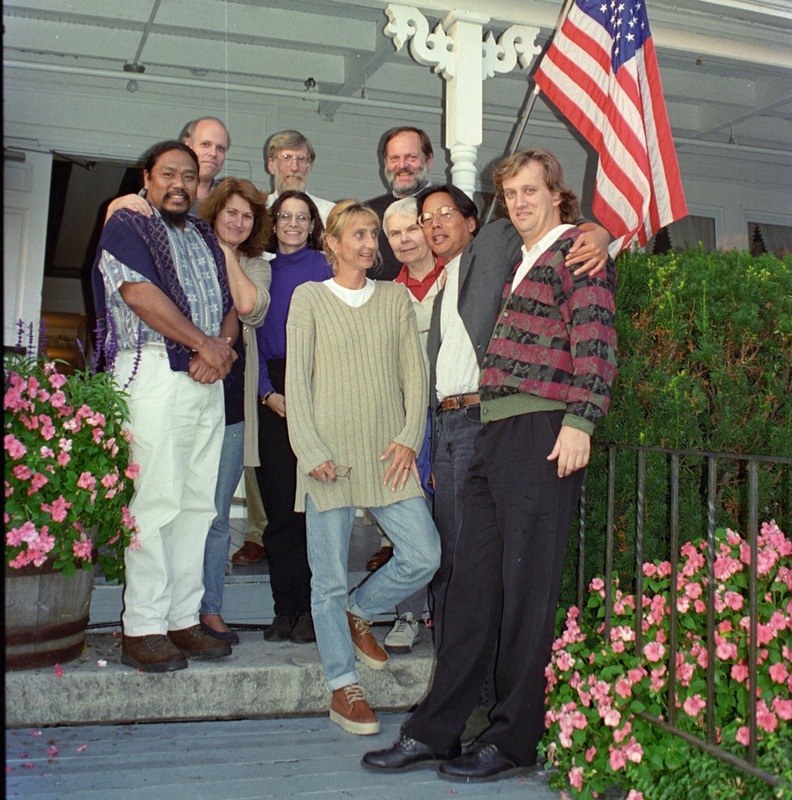 Left to right: Martin Nakata, Jim Gee, Mary Kalantzis, Norman Fairclough, Sarah Michaels, Carmen Luke, Courtney Cazden, Gunther Kress, Allan Luke, Bill Cope. With the notion of Multiliteracies, we added two ‘multis’ to the literacy agenda: multimodality, or the increasing convergence of visual, audio, gestural and spatial modes of meaning in the new communications environment; and multilingualism, not just in the sense in which global forces expose us more intimately to different languages in our everyday and educational settings, but also in the sense that social languages (dialects, registers, peer discourses, strands in popular culture, and specialist discourses of profession, technology and interest) were becoming more different to each other even within a language like global English. As a consequence, navigating the world of meaning was more a matter of crossing boundaries between different discourse communities than learning the rules of a ‘standard’ language. The only rule was that there are no rules except those of a finely situated ‘social language’, and that negotiating language differences was more important than thinking you could get language ‘right’. One of our abiding concerns has been the nature of cultural and social diversity and the implications of this diversity for schools. We also became interested in changes in the nature of citizenship in a world where the nation state was becoming a less significant locus of power and identity. In 1995, Bill took up the position of Director of the Office of Multicultural Affairs and a Division Head in the Australian Government’s Department of the Prime Minister and Cabinet, charged with developing and implementing policies for one of the most diverse countries on earth (forty-one per cent of the population has at least one parent not born in Australia; two and a half per cent of the population is Indigenous). There, he developed the Charter of Public Service in a Culturally Diverse Society, subsequently taken up as guiding principles at all three levels of government in Australia. Department of Immigration and Multicultural Affairs, Charter of Public Service in a Culturally Diverse Society, DIMA, Canberra, 1998. In 1991, we established the Centre for Workplace Communication and Culture at the University of Technology, Sydney, a research and development centre. Here, we became involved in research into the language of the new workplace, and, more generally, thinking through changes in the nature of work engendered by new technologies, new systems of management and globalisation. We also got involved in developing national competency frameworks that link education and work. download. Cope, Bill, Mary Kalantzis, Anne Pauwells, Diana Slade and Daphne Brosnan, Local Diversity, Global Connections. Australian Government Publishing Service, Canberra, 1994. Volume 1: Six Approaches to Cross-cultural Training—A Report, 101pp; Core Principles for Effective Cross-cultural Training—A Training Manual, 69pp. Cope, Bill, Mary Kalantzis, Allan Luke, Bob Morgan, Rob McCormack, Nicky Solomon, Diana Slade, and Nancy Veal, The National Framework of Adult Language, Literacy and Numeracy Competence, Australian Committee for Training and Curriculum, Melbourne, 1993, 80pp. Cope, Bill, Mary Kalantzis, Joseph Lo Bianco, Andrew Lohrey, Allan Luke, Michael Singh and Nicky Solomon ‘Cultural Understandings’ as the Eighth Key Competency, Queensland Department of Education, 1994, 44pp. We moved to Melbourne in 1998 when Mary became Dean of the Faculty of Education, Language and Community Services at RMIT. There, we began to research the ways in which the new media, information and communications environment was transforming not just the practical content of ‘literacy’, but, more broadly, our social worlds, and even our sensibilities. At this time, bill co-ordinated a major project for the Australian Department of Industry on the impact of new technologies on publishing, Creator to Consumer in a Digital Age, and became involved in research and development work on semantic technologies, including the development of Common Ground Markup Language and a patent addressing aspects of the creation and location of digital texts. Also at this time, Mary became President of the Australian Council of Deans of Education. Just what should the Council be advocating as an imaginative yet workable future for education? What should it be asking of Governments? The Deans tried to answer this question in a Charter which outlined an agenda for New Learning. This led us into a more widely encompassing reconsideration of the nature and role of education in a dramatically changing society. In the early 2000s we returned to the down-to-earth world of classrooms and curriculum where we had begun several decades before, bringing together our longstanding concerns about learner diversity and pedagogy, and add to these our more recent insights into the new, digital media. Out of this mix, emerged the ‘Learning by Design’ project, examining the microdynamics of learning, and what it takes to engage diverse learners, living in a world where they are no longer content to be served up knowledge and replicate the right answers. These are new times, and a new generation will not necessarily respond well to the balance of agency that existed in earlier classrooms and families between teacher and learner, and adult and child. Our mission is to read the times, create learning environments appropriate to the times, and design institutions and pedagogies which enervate every fibre of subjectivity in today’s and tomorrow’s generations of learners. In 2006, moved to the United States, and at an interestingly uncertain moment in the history of education. Mary became Dean of the College of Education at the University of Illinois at Urbana-Champaign, one the leading research Universities in the US, and Bill a Research Professor. This is a country with a deep educational traditions, a place where in the twentieth century, modern, ‘progressive’ education was invented, yet a place where the ‘back to basics’ movement has in recent decades undone much of that tradition with its swing back to rigid managerialism via testing, and skills and content-focused curriculum to match. The excesses and failures of this swing are now coming to light. Not only in the US, but around the world, people are coming to ask, ‘what will an education look like which is appropriate to the knowledge economy and which uses the new media?’ This is what prompted us to start putting together an agenda for a New Learning. This has translated into a series of publications, listed below, and also the development of an online masters degree in New Learning and New Literacies. With the support of a US Department of Education grant, we have developed a ‘Web 2.0’ or ‘cloud computing’ technology for teachers to design ‘Learning Elements’, or online modules of teaching content. This web space consists of two closely interconnected online spaces, which users can choose to view separately or juxtapose in side-by-side panes presenting parallel views: a ‘teacher resource’ space in which lesson planning occurs; and a ‘learner resource’ space in which this plan is translated into student-accessible text for independent or semi-independent learning. This project has applied key elements of today’s social web technologies to the collaborative design of content amongst teams of teachers, easy dissemination to students, and rapid, responsive formative and summative assessment of student work. Although our focus has moved to the use of technologies in learning, our work remains steadfastly about people. The new technologies are cheap and lightweight, and within the reach of every learner via one kind of device or another. They are technologies of self-creation as much as they are technologies of content reception. They present opportunities for the creation of learning communities which energise knowledge communities by supporting lateral, peer relationships of co-creation and learning. The technologies themselves are not the point. It is the social affordances of these technologies that interest us. We can do the most predictable of the ‘old basics’ in these spaces. In fact, the first generation of so-called ‘learning management’ systems often did just that; they drilled and killed. But we can also use these virtual learning spaces to make schools more congenial to learners, more manifestly contemporary and ‘real’ in the media they use, and more sensitively differentiated to address different identity motivations and skills levels. They are also becoming cheap and accessible enough for every learner. We have an opportunity here to transform the social dynamics of learning and the outcomes for all learners. In 2009, we began research into academic knowledge systems. Scholarly publishing is in a state crisis, and at the same time on the brink of potentially transformative change. This area of our research investigates academic publishing, descriptively as a series of business and technical processes, and analytically as a pivot point in the formal knowledge systems that are at the heart of our society’s understanding of itself and the natural world. For us, the central question for research into academic publishing is that of the immediate past and future shape of our knowledge design processes. Our research analyses the impact upon academic publishing of disruptive changes in our technological, economic, distributional, geographic, interdisciplinary and social relations to knowledge. This investigatory and theoretical work is complemented by the practical interventions of Common Ground Publishing. Cope, Bill, Mary Kalantzis, and Liam Magee, Connecting Knowledge in Academic Research: Towards a Semantic Web, Woodhead, Cambridge UK, 2010 | Link. Since coming to the United States, we have been fortunate to receive a cluster of large grants from the Institute of Educational Sciences in the US Department of Education. These were awarded to design and text a new writing environment that used social networking and cloud computing technologies. We have been fortunate to find ourselves in an environment so well suited to this work. Just down the road from where we work, the University of Illinois was building the world’s largest and fastest computer, funded by the biggest single grant ever made by the National Science Foundation. In this University, the world’s first e-learning and messaging system, PLATO was invented; and the plasma screen, the web browser, and key linking pieces in our interconnected world such as Apache, PayPal and YouTube. In this rich intellectual context, we have brought together cross-disciplinary teams of literacy experts, psychometricians and computer scientists to build and test a student working and assessment environment, Scholar. Here is our vision for this work: imagine having a learning information environment which provides learners, parents, teachers and the public with all they need to know about student progress without having to have end-of-program tests. In this social web working environment, students can create written texts, as well as embed images, sound and video. Students work both individually and collaboratively, representing online various kinds of complex knowledge performance—such as scientific report writing or persuasive writing in language arts. In this research and development work, we use cutting edge natural language processing technologies and psychometric mechanisms to provide on-the-fly feedback to learners. Scholar offers a repertoire of technology-mediated social assessment mechanisms: teacher-created and student-actioned rubric or schema-based tagging and ‘Web 2.0’ style commenting and rating of student works by teachers, parents, experts, peers and self. Scholar provides students with continuous feedback (formative assessment), whilst also collecting enormous amounts of data on student learning activity, and synthesising this into more valid and reliable summative assessment data than is available in today’s end-of-activity or end-of-program tests. Eventually, it will track and measure individual student progress over time and individual student performance in relation to cohorts (the class, students of the same demographic profile, and so on). Social web technologies such as these allow the relationships of learning that have been initiated in the classroom to continue beyond the walls of the classroom and the timeframes of the school timetable. In these projects, we are developing multimodal working environments for learners. They support the capture of text, image, tables, diagram, video and audio, thus allowing the construction of a wide range of multimodal texts such as scientific reports, history essays and social studies projects. They also support collaborative work, maintaining an audit trail of co-authors’ varied contributions. Our aim in these projects is to reconfigure traditional curriculum design and instructional roles, no less. If we even make small progress in that direction, we will consider that a significant achievement. None of our parents, or grandparents, or for that matter anybody in our families’ pasts, finished secondary school. We finished school, went on to university and became academics. We consider education not only to have been a privilege. It has been a remarkable gift, one which, but for accidents of circumstance, we may not otherwise have expected. Many of our peers did not enjoy such privilege. The story of social mobility in the modern world is not uncommon—in our cases for immigrants, or less educated people who have aspirations for their children. For the world’s billions, however, mobility is the exception rather than the rule. The social position of one generation by and large predestines the social position of the next. And when mobility opportunities do arise, the reason for the opening most often is education. We live in a grossly unequal world, and even the most strident defenders of the status quo argue that the system gives everyone one best chance. This chance is education. The chance is ‘equality of opportunity’. The reality, of course, is that not all schools are as well resourced as others. And some students from some kinds of background find the culture of conventional schooling more congenial than others. As a general rule, those who find schooling congenial and who go to schools well enough resourced to be thought ‘good’, succeed; those who do not, fail. This is how, despite its promise, education also reproduces inequality. All schools can be congenial to learners. All schools, even less well resourced schools, can provide powerfully engaging and effective learning experiences for all learners. And because they can, they must. More boldly, and more contentiously, we believe that, for the first time education’s promise can be made real for all. Our reason is the potentials offered by the conjunction of new technologies of meaning-making with an epochal shift in what we call the ‘balance of agency’—in which old cultures of command and compliance are being displaced by cultures of contribution and creative collaboration. If we, as educators, allow learners more agency, and we use whatever technological resources are available to support new relationships between learners and their learning environments, we may be able to achieve something that has not so far been achieved in the modern history of mass-institutionalised education—greater equity of outcomes. In our work, we have set out to explore the ways in which such a utopian objective may be achieved, at least in part, and at least as an incremental step an broader, social learning journey. We’ve been tackling these challenges from a number of perspectives for several decades now, and have had the enormous pleasure and privilege to have worked with some of the smartest and most committed teachers and scholars of education. We have worked with people in countries which we as children could barely even imagine we might one day visit, let alone work. We have been able to journey across the nexus of learners’ lived experiences, classroom environments, and the professionalism of teachers in an often demanding and mostly materially under-rewarded job. We’ve witnessed travesties of educational justice that would make you weep, and breakthroughs—for a learner here or a whole school there—that uplift one’s soul. It has been a journey in which we have moved between finely grained insights and big ideas, between grounded local initiatives and portentous historical possibility. We have had to traverse a territory that is as wide as having to address questions of human nature and cognition; the consequences of global human movement; the tension between private interests and public goods; the ‘civilisational’ achievements of literacy and the technological affordances of changing media for meaning making of Multiliteracies. In making our case for a ‘new learning’, we have never moved far from our personal stories and what motivates us as educators. We have spent our adult lives devoted to realising what we consider to be one of the key promises of democracy. Despite changes in pedagogical fashion, content emphasis, and classroom organisation, teacher preparation and professional learning, the inequalities of learner outcome between different social groups are at best staying the same or at worst widening. We need to change this situation, and where we are slipping back, to turn things around. This theme lies at the heart of our intellectual journey, a journey in which we have sought to make a difference in the way teachers design learning so that it transforms learners into high performing, self actualised, competent social actors, irrespective of their backgrounds.